Lower Columbia River dams began court-ordered spring spill this week to aid migrating juvenile salmon and steelhead just one week after spill began at lower Snake River dams. As is the case with the court-ordered spill that began a week ago at Snake River dams, spill at Columbia dams will be to the maximum total dissolved gas levels allowed by state water quality standards, known as gas caps. Percentage caps on total dissolved gas (caused when spill plunges into the river) are intended to protect young fish from gas bubble trauma during spill. A three-judge panel of the Ninth Circuit Court of Appeals ruled April 2 in favor of an April 2017 U.S. District Court injunction allowing more spring spill at four lower Snake and four lower Columbia river dams. With the decision, spill to the gas cap began April 3 at lower Snake River dams and at lower Columbia River dams April 10. Dan Turner of the U.S. Army Corps of Engineers' River Control Center told the interagency Technical Management Team at its meeting Wednesday, April 11, that the Corps began gas cap spill this week at McNary, John Day, The Dalles and Bonneville dams. Total dissolved gas is measured at the dam's tailrace where the cap is 120 percent TDG, but also at the downstream forebay, where the cap is 115 percent. The Corps has developed levels of spill – spill target – that it believes would result in the allowed TDG levels. The spill target at McNary Dam is 190,000 to 195,000 cubic feet per second, although the actual daily average spill April 10 was 184 kcfs, which produced a tailwater TDG measurement of 118 percent. Spill at the dam the day before was 90 kcfs, producing 114 percent TDG. Due to travel time of about two days between dams, TDG in the downstream forebay at John Day Dam was still at 106 percent. Spring spill at McNary Dam in 2017 was 40 percent of the river day and night. The spill target at John Day Dam is 140 kcfs and the actual daily average spill was 138 kcfs, which produced a tailwater TDG measurement of 120 percent. Spill at the dam the day before was 14 kcfs, producing 111 percent TDG. TDG in the downstream forebay at The Dalles Dam was still 114 percent. Spring spill at John Day Dam in 2017 was 30 percent of the river day and night April 10 to April 28 and 30 or 40 percent of the river April 28 through June 15. 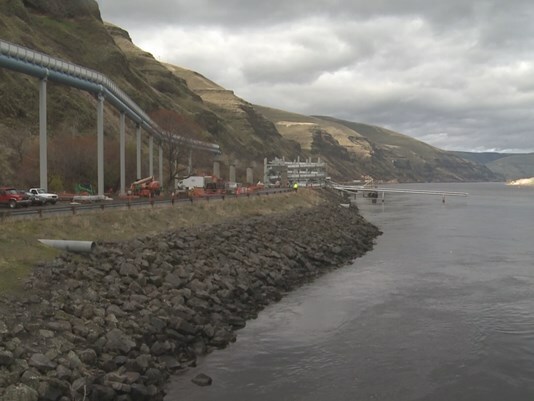 The spill target at The Dalles Dam is 125 kcfs and the actual daily average spill was 123 kcfs, which produced a tailwater TDG measurement of 118 percent. Spill at the dam the day before was 72 kcfs, producing 110 percent TDG. TDG in the downstream forebay at Bonneville Dam was still 111 percent. Spring spill at The Dalles Dam in 2017 was 40 percent of the river day and night. The spill target at Bonneville Dam is 128 kcfs and the actual daily average spill was 127 kcfs, which produced a tailwater TDG measurement of 120 percent. Spill at the dam the day before was 40 kcfs, producing 114 percent TDG. Bonneville is the lowest dam on the Columbia River, so there is no downstream forebay measurement. Spring spill at Bonneville Dam in 2017 was 100 kcfs day and night. The plea for more spring spill to the gas cap was brought to District Court Judge Michael H. Simon in January 2017. Simon agreed that more spring spill would benefit ESA-listed fish, but delayed the action until 2018 while federal agencies completed a spill plan for lower Snake and Columbia river dams. That plan was submitted to the court Dec. 8, 2017 and Simon affirmed the plan in a January 8 order. The Bonneville Power Administration has determined that the cost of this additional spring spill could cost the region $40 million in foregone revenue due to water being spilled instead of being used to generate electricity. Snake River dams have had a full week of the new spill regime, according to Turner, and it's been a learning experience for the Corps. For example, while keeping Lower Granite tailrace TDG near the 120 percent cap, it's been difficult to keep the Little Goose forebay gas cap at 115 percent (it's more often near an average of 117 percent). Spill at the upstream dam can't just be adjusted instantaneously to hold forebay TDG levels within limits because of the two day travel time. Wind can be factor. With higher winds, the Corps can expect lower TDG, but when it factored an expected wind storm into its spill decision last weekend, the winds failed to materialize. Another factor is barometric pressure, Turner said. Higher barometric pressure produces lower TDG.